Several bloggers posted about the new Vogue patterns. Everyone must have been visiting the site as it came to a crawl last night. Then this afternoon, it was back to normal. And yes, I said I was going on a Pattern diet; yet there were several patterns that kept calling my name. When I went to buy, two of the four I wanted were out of stock!!! Wow, I don't recall ever seeing that on Vogue. I decided I would just wait until another time to buy any patterns. I will be on the lookout locally for these two; however I don't think they will show up at JoAnn's anytime real soon. But I will be checking! Why didn't I make this dress before? Let me say that I had planned to make this dress soon after I purchased the pattern, which was in 2012. I kept putting it off and making other garments. I am truly happy with the fit of my new dress that is almost complete. The FBA I made was perfect. Because this is a multi-sized pattern and I was able to cut larger then take in, the fit through the waist and hips was an easy fix to make. My fabric met the stretch-ability test for this project; it was some very fiddly knit though. My serger did not like this knit very much and sewing on the sewing machine required very taut sewing in front of and behind the sewing foot. I still have to insert the sleeves and attach bias binding to the neckline. Of course, hem the dress also. I am debating on the front neckline. 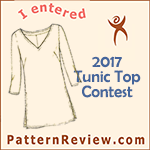 Several reviewers at PR indicated that they shaved off a little at the front neckline as it is very close fitting at the front neck. I have made a little progress on the Vogue knit dress. This has been a busy week at work and by the time both DH and I get home there is not a lot of energy to go around. Most of the progress has been on serge finishing edges and affixing stay tape to front piece. I plan to begin the gathering of the side front pieces this evening. I plan to have the dress completed and started onto another project this weekend. I did buy one new pattern and some fabric from Mood this week. I am placing myself on a pattern/fabric diet now. I have plenty to work with/on at this time. I don't keep up with how much yardage of fabric I have and how much I have used; I can visualize that I have a lot!! and even get moments of surprises when I find a piece of fabric I had forgotten about. Yeah-the top is completed; all tweaks that can be done are done! There will be a next time and pattern alterations have been made also. Photo to follow. Back to dresses now. 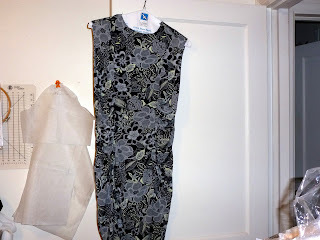 I put aside making this dress to participate in the 2013 Top Sew Along. It really looks much better in real life than this photo I took. This really looks washed out. Fabric was acquired in 2012. Fabric was acquired years ago from Les Fabrique in Charlottesville, VA. It is from the orange/tangerine/nectar family. Right now I do not have a photo. So off to the sewing room. Will post more later. 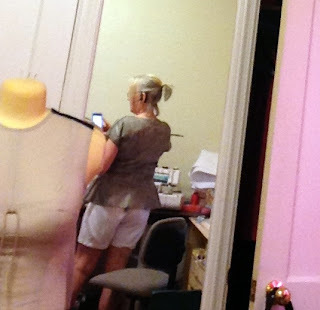 The Simplicity peplum top is almost complete. I just took a break from early Saturday morning sewing. The top is hemmed and the neck facings are attached, waiting to be clipped and pressed. I basted the back princess seam in the upper back area to take out some of the back fullness and hopefully that will be the final adjustment so that I can think about wearing the top soon. After this is completed I have been thinking about making several dresses. I have some new fabric purchases that I really should begin to make something from them as the purpose was to have some floral print dresses or tops. I also want to make a jacket and skirt using fabric purchased from Vogue fabrics recently. I have pulled out numerous dress patterns to consider and just having a hard time making the decision of which one I want to sew. Well--I ran into some fitting issues and some I think I should have anticipated from the beginning. Just because the finished measurements are posted on the pattern piece, does not mean one should believe those measurements. I ended up letting out all seams, ending up with 3/8 inch seam allowances to give me the room I needed from below the bust down. Thank goodness for princess seams and being able to adjust all around. 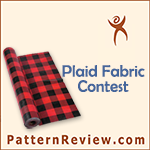 Having said this about this pattern, it is a well drafted pattern in that all pattern pieces line up well. I really need a 14-16-18 pattern and this one ended with 14 and the next sizes up would have been way to big in upper chest and shoulder area. I will make this one again and will adjust for more width from under the bust down. The FBA I made was perfect. I also think the back piece is too long and could/should have folded out some of the length in the back above the waist. Inspiration comes in many forms when it comes to sewing. Many of us sometimes hit a sewing block, loss of sewing mojo being between seasons, etc. Our local ASG had Susan Khalje as a presenter at our sewing meeting this past Thursday. That was a real treat and pleasure. She presented for about two hours and we got to see some nice samples of her week; many of which I remember seeing in Threads but so nice to see up front and personal. After that I felt even more energized to sew and have taken advantage of brief moments of sewing when longer periods have not been available since the class. Meaning I also have gotten away from TV and games on the iPad!! 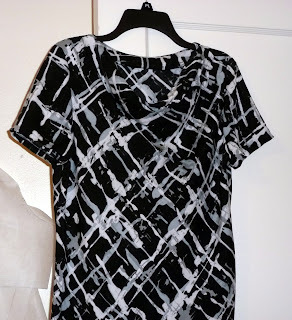 I have started this next top project but will not complete it by tomorrow's deadline for the top sew along. I made numerous fitting adjustments and then cut out the Mood faux leather fabric. All pieces have edges serge finished. Sewing machine is set up and ready to go. Now I just need to sit down and sew. 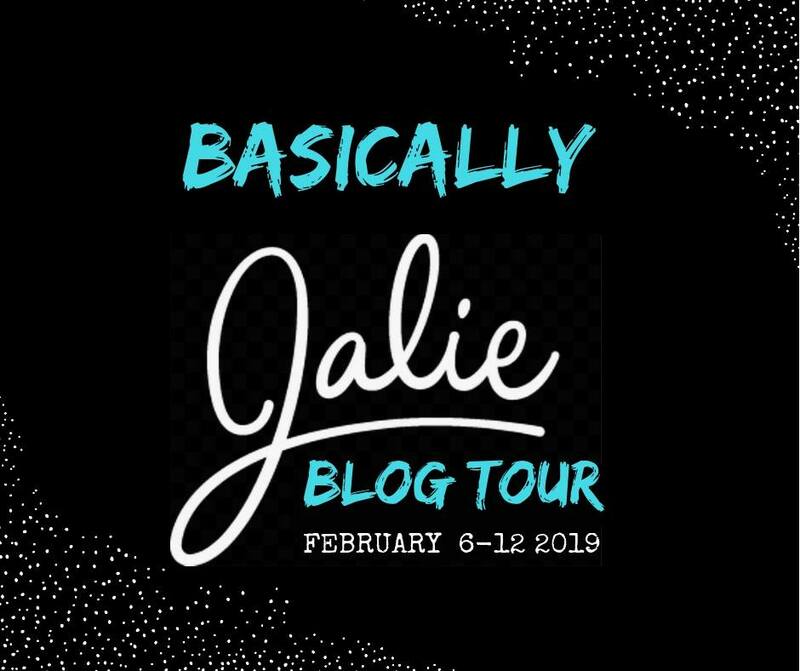 More information to share later. I took photos of V9771 #2 last night. The back of this one pools at the center back and this one feels a little snugger in the hip area. I don't recall this from the first one and did not make note of this on the pattern if it was the case last time. I don't anticipate wearing this out as it shown here as normally I tuck tops/blouses in my skirts or pants for work. This of course could be a casual top and those are worn out as seen here. 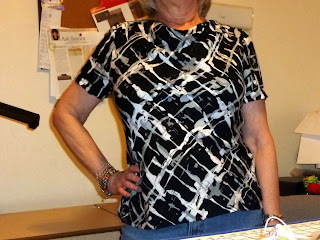 This is my second top for the 2013 Top Sew Along, I still need to hem the bodice and tack down the back facing. I made my first version in November 2012 with great success and this version fits as well as the first one. I am letting this hang a little longer so if the bias wants to grow, it can before I do the final hemming. I really like the drape at the neckline. This fabric is from Fabric Mart. My next top is a peplum style top using this snake skin faux leather from Mood. I cut a small sample and wet it do see if it shrinks and how it holds up while it is wet and how it feels when it dries. It did not shrink and felt basically the same before wetting it. The backing on this one feels somewhat like a knit. I am in the process of preparing the pattern for pin fitting and probably consider making a test garment or muslin first before cutting into this fabric. Tomorrow is back to work for me. I thoroughly enjoyed my time off sewing and making more sewing plans.